Residents of Parsippany and surrounding communities can receive low-cost, high-quality medical care from Zufall Health the first and third Tuesdays of each month at NewBridge Services in the Troy Office Centre on Route 46. 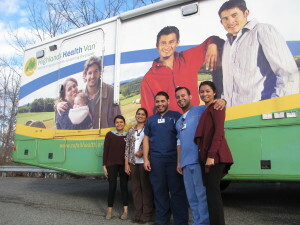 The Zufall Highlands Health Van team in Parsippany: Christine Emmanuel, AmeriCorps Community HealthCorp member; advanced practice nurse Smitha Prasad; Steven Garcia, certified medical assistant; William Torres, patient representative; and Yamileth Rios, registered nurse. NewBridge, a nonprofit provider of counseling services, housing and educational programs, has partnered with Zufall Health, a fully licensed, Federally Qualified Health Center to bring Zufall’s Highlands Health Van to Parsippany. “We are proud to partner with Zufall to make primary medical care and counseling services convenient and affordable in the community,” NewBridge CEO Robert L. Parker said. The 37-foot van, staffed by an advanced practice nurse and other medical professionals, has two exam rooms and an intake/waiting area. Zufall performs checkups, treats illnesses and injury, does preventive care, offers health education and counseling, and makes referrals to specialists. Medicaid, Medicare, Family Care, and private insurances are accepted, and patients without insurance pay on a sliding scale based on income. Appointments are available between noon and 5 p.m. and walk-ins are welcome. “I don’t have a regular physician, but I wanted to get a physical,” said Daniel Buckley, a NewBridge client who had an appointment at the van last month. “Everyone here is so nice, and I got what I needed,’’ Buckley said. NewBridge opened its large, centralized Parsippany center in August to better serve Morris County residents. Located near the crossroads of routes 80 and 287, the 15,320-square-foot space has 20 counseling rooms and spacious group therapy rooms, as well as a drop-in center for clients. It’s also the new home of NewBridge Jobs Plus, a free program that has helped more than 3,000 young adults earn their high school diplomas and prepare for careers. The NewBridge center has the capacity to serve residents quickly, so they don’t have to endure long waiting lists to get the care they need, Parker said. Zufall has been providing high-quality, affordable, compassionate medical and dental care to patients at locations in Morris, Sussex, Hunterdon, Warren, Somerset, and Essex counties for more than 25 years. Residents can schedule an appointment for the Zufall van by visiting NewBridge’s Parsippany center at 1259 Route 46, Building 2, or by calling (973) 316-9333. The program is supported by a grant from the Johnson & Johnson corporation.